Are you looking to improve your offering? Are you failing to attract new customers? This blog shows you how you can work with the people who know best to discover innovative ideas and ways that you can refresh you offering to attract more new customers. 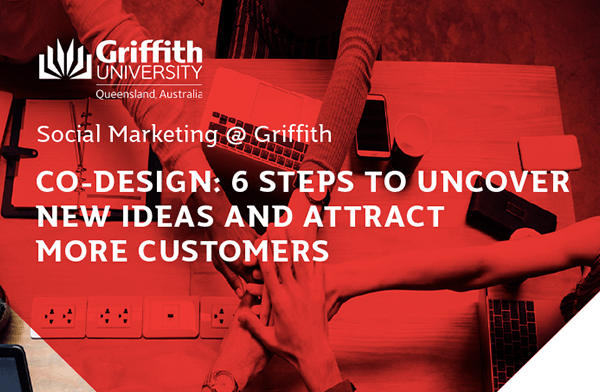 Following 6-easy steps, you can apply co-design to understand how more people can be attracted to your offering. The constant strive for new and improved experiences is a popular topic around the world. Whether it’s the latest mobile phone, a self-driving car, video game or smart refrigerators, it is quite easy to find excited people who are willing to help companies improve their design or develop new products, services and programs. Co-design empowers people recognising they are experts of their own experience. Working with the people who know your offering best can prevent costly failures. By working with the people who know best (students who would have to participate in the program) the research team was able to discover new and innovative ways to improve the program. Not everyone recognises that they are experts who have a lot to offer. Recently, Social Marketing @ Griffith co-designed Blurred Minds with 58 high school students aged 14–16 years across six co-design sessions. By working with the people who know best (students who would have to participate in the program) the research team was able to discover new and innovative ways to improve the program. New online games (including a virtual house party) and activities were developed with students. Students were able to voice their opinions, and they felt “empowered” to be part of an important cause – changing the lives of their fellow students. Our step by step guide to co-design (see Figure 1) is explained in Dietrich et al. (2017). Read on to learn how to plan and run one of these sessions. The 6 step co-design process was developed to guide readers into discovering new, innovative and unique ways to attract more customers. This step by step guide details the six co-design steps showing you how to apply co-design to your offering today. In our co-design guide, we take you through one of our main examples "Blurred Minds." Blurred Minds was successfully co-designed with high school students to develop a new and useful alcohol education program. Wina Smeenk is an innovation strategist and designer, who believes co-design is more than just working together. She recognises that working with users, problem owners and creatives will lead to innovative, sustainable and meaningful situations and solutions. By working with people with dementia, care institutions and development teams, through co-design sessions, she successfully created a dementia simulator which positively impacted on the behaviour amongst a range of people.